As their infatuation with President Obama fades, millions of Americans anxiously ask, Is this the change we were waiting for? The current administration represents change, for sure, Steven Malanga argues a momentous transformation of the fundamental structure of American politics. A self-interested coalition of public-sector unions and government-financed community activists (like the young Barack Obama) has become our era's characteristic political machine. In Shakedown, Mr. Malanga shows how this machine's single-minded goal is always bigger government and more public spending. The bill, he says, is now coming due for the relentless rise of this new political powerhouse. He chronicles how public-sector unions and the corrupt political hacks beholden to them have all but bankrupted once-rich states like California and New Jersey. He details the campaigns to undermine the successful and popular 1990s welfare reform and to revitalize the failed, wasteful War on Poverty programs that funnel taxpayer money to the advocacy groups that are integral cogs in the new political machine. And he provides a comprehensive summary of how these same advocacy groups spent decades helping undermine mortgage standards in the name of helping the poor—in the process enriching themselves and enabling the housing meltdown. As Americans anxiously ponder the future direction of their government and their economy, Shakedown explores the questions of who got us in this mess and why we need change—constructive change—more than ever. Steven Malanga is City Journal Senior Editor, a Manhattan Institute Senior Fellow, and a RealClearMarkets.com columnist. He writes about the intersection of urban economies, business communities, and public policy. Prior to joining City Journal, Malanga was executive editor of Crain's New York Business for seven years, serving on the publication's editorial board and writing a weekly column. He also supervised special projects, including investigative stories. Before that, Malanga served for seven years as managing editor of Crain's. During his tenure at the publication it twice won the General Excellence award from the Association of Area Business Publications (AABP). "If you have high blood pressure, you do not want to read Steven Malanga’s Shakedown: The Continuing Conspiracy Against the American Taxpayer, unless you have taken a mega dose of your medication. Otherwise, you will blow a "gasket" as Malanga chronicles how a coalition of thuggish public sector union bosses, self-serving politicians, crony capitalists, misguided clerics and parasitic community activist organizations rule America, "enrich" themselves and expand big government in the name of fighting poverty. In addition, Malanga reveals how public sector unions have used every means available, including their incredible political clout, to obtain higher wages and benefits for local and state government workers at the expense of the general public. . .In sum, Steven Malanga has performed a valuable public service in writing Shakedown. Let's see if our public servants provide the leadership to do the right thing and downsize government or continue to be part of the conspiracy against the American taxpayer." "Anybody not fully convinced that unions and their bought-and-paid-for pols are ripping off America ought to pick up "Shakedown: The Continuing Conspiracy Against the American Taxpayer." Author Steve Malanga of the Manhattan Institute offers compelling examples to show why so many cities and states are drowning in red ink. One of my favorites involves a California nurses union that became so militant, it joined the Teamsters! Read it and weep." "Steven Malanga is the 'preeminent expert on municipal finance in the United States of America.'" "The new, new left has brilliantly exploited a vulnerability of democratic politics: Politicos respond to organized pressure groups that have the clout to either help or harm them. Steve Malanga tells the grim story of how such unions and their allies have financially undermined New Jersey, New York and other political entities." "The mainstream media is not interested in exposing the powerful machinations of public sector unions and social service advocacy groups, and their increasingly strong grip on politics. Why? For that you have to turn to writers like Steve Malanga and books like Shakedown." "While the federal fiscal mess has had lots of attention, Americans face even more danger from runaway spending and improvident pension promises by state and local governments. Steven Malanga provides the grisly details in Shakedown: The Continuing Conspiracy Against the American Taxpayer. He shows how public sector unions and government-financed "community organizers" are wreaking ruin on our private sector economy." ...Governments across the country have been using federal community block grants to build convention centers and hotels that private developers won't, creating an excess supply. As Steven Malanga writes in his 2010 book, "Shakedown," "the [convention center] building boom has sparked little, if any, economic development." One example close to home stands out: "The Washington, D.C., convention center, built with $834 million of public money, is attracting no more business than the city's previous, smaller center," says Mr. Malanga. . .
. . .The state's pension and retiree health care programs are like a giant blob in a science fiction movie, rolling over the landscape with ever-increasing speed, growing larger by the day until it's big enough to consume everything in its path. The Legislature, pandering to greedy special interests with no regard for economic reality, created it. Steven Malanga, in his new book, "Shakedown," notes that in 2005 New Jersey legislators proposed 86 bills that would increase pension benefits "even though then-Gov. Richard Codey declared that "these entitlements are strangling the taxpayers of New Jersey.' ". . .
. . .There are numerous reasons and attitudes that led us to this place and in no small measure public sector employees hold a great deal of responsibility for the calamity we find ourselves in. Journalist and Sr. 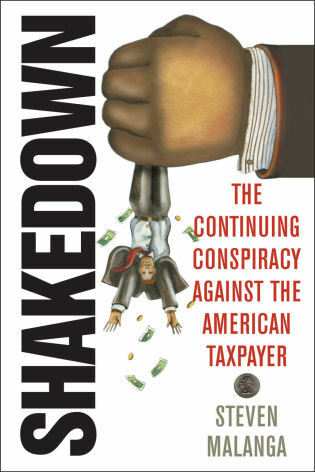 Fellow at the Manhattan Institute Steven Malanga has written a fantastic new book, Shakedown – The Continuing Conspiracy Against the American Taxpayer, that not only talks about the cause of our collective mess, but provides insight on how we should deal with the problem. . . It's the battle that will begin again in earnest the day after election day. Are we, as a state and nation, finally going to get serious about paring down government? Two recent books do a very good job outlining one of the larger contingents within the pro-tax increase, pro-government growth side of the fiscal battle... The other book is called "Shakedown: The Continuing Conspiracy Against the American Taxpayer" by Steven Malanga. . . .Steve Malanga of the Manhattan Institutecomplains that politicians get union political support by granting government workers generous pensions and health benefits. After those politicians leave office, taxpayers are liable for trillions in unfunded promises. "It's squeezing out all other spending," Malanga says. . .
Steven Malanga, author of The New New Left: How American Politics Works Today has released a new book. Shakedown: The Continuing Conspiracy Against the American Taxpayer details the shameful people and politics behind the crushing debt and runaway taxes plaguing many states...It’s good that we have a writer like Steven Malanga to tell it like it is. It would be better if we had more elected officials who would listen to him. I am currently reading Steven Malanga's superb new book, "Shakedown: The Continuing Conspiracy Against the American Taxpayer" and came across this quote from Barack Obama (circa 1995) when a reporter asked him about the trials and travails of community organizing. Steve Malanga writes in his new book Shakedown, "State and local governments used tax surpluses and the 1990s stock-market rise to gold-plate pension programs, with disastrous effect once the stock boom ended." He reports that by 2003 these pension programs had more than $250 billion in unfunded liabilities. In California, pension costs zoomed fourteen-fold from $160 million in 2000 to $2.6 billion in 2005; in 2010 the number will be close to $3.6 billion. No wonder the state is broke. ....Steve Malanga, a public policy expert whom Christie cites as one of his intellectual influences, warns that the governor's job will get harder as financial necessity forces him to go beyond politically easy targets like public-employee unions and take on programs that are popular with the taxpaying middle class.